Hania is ﬁve years old going on six. I took this photo of her March 19, 2011 at the School of Knowledge and Religion in Kabul, Afghanistan. 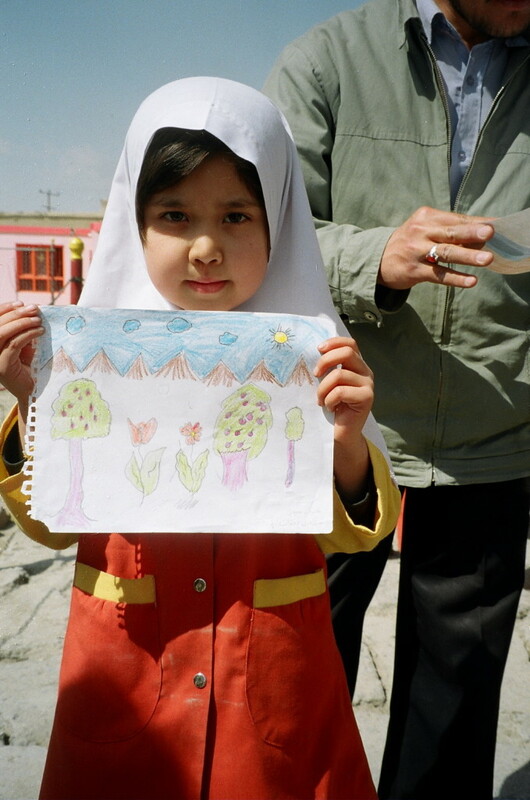 She’s holding a drawing of trees she made for a “tree-planting for peace” organized by the Afghan Youth Peace Volunteers. Just prior to the tree-planting, the group, who have all lost parents or siblings in the Afghan war, read a poem they wrote for the occasion (below). Find out more about the group at livewithoutwars.org. that Power and Privilege consistently oppress the People. & accepted universally like any other conventional tree. its shade kills the People. Why would an Afghan mother want a tree that kills? Why would scholars promote it? Why would the few rich and powerful insist on it? Why would the People want it? War is NOT what we wish to plant on any day, & certainly not today. we need to plant a different tree.